With the designated runner on second base to start the bottom of the 10th, Louis Head (2-1) struck out Logan Taylor and Nick Zammarelli III. But the right-hander plunked Joe DeCarlo and walked Jordan Cowan to load the bases before Odom took four straight pitches to force in the winning run. "Mainly, I was just trying to get a fastball to hit, something middle-in," Odom said. "The first two were kind of pulled away, so I knew I was in a good spot. When he threw a ball, I knew I was taking 3-0 to make sure he could throw a strike and it worked out that he didn't." Dodgers No. 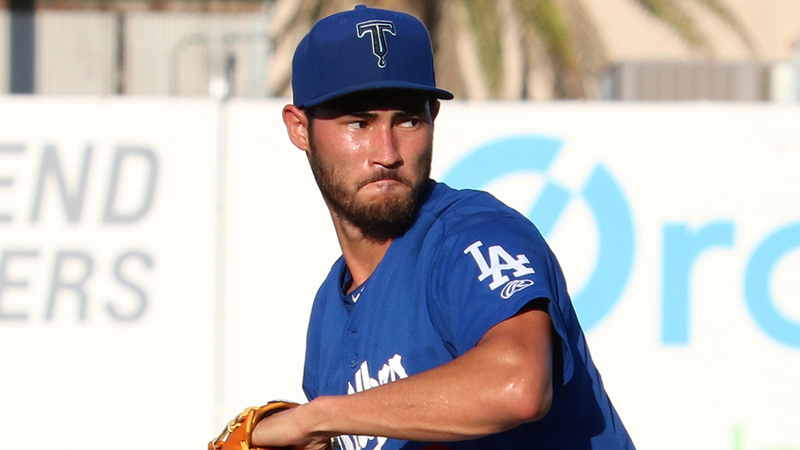 8 prospect Mitchell White worked the first four innings for Tulsa, striking out six and walking three. Parker Curry was perfect for three frames and 25th-ranked Marshall Kasowski walked two in the eighth before escaping unscathed. Head struck out the side to force extra innings. Sunday's no-hitter was not the first in which White was involved. He also threw four innings on April 7, 2017 and combined with Alex Hermeling on the first no-hitter in Class A Advanced Rancho Cucamonga history. Odom had the extra burden of handling a Travelers pitching staff that had to match the Drillers inning for inning. Darren McCaughan fanned eight and allowed three hits over the first six frames, extending his season-opening scoreless streak to 12 innings. He didn't allow a runner to get past first base. Parker Markel (2-0) worked around one hit over the final two innings for the win. "I think everyone was excited that the game was over because it was grueling at-bats up there," Odom said. "We were getting it kind of handed to us. The biggest thing is guys were happy that we got the 'W' and the pitching staff pitched great, but also everyone's kind of relieved that it was over." Now Odom will always be able to say he played in a game where his team was no-hit and still won. "It's something I'll definitely tell other teammates, family and friends," he said. Tulsa's last no-hitter came almost 18 years ago to the day as Andy Pratt threw a seven-inning gem against Arkansas on April 13, 2001. The last Texas League team to pitch a no-no and lose was Oklahoma City, which got five hitless frames from Orval Grove and Wilcy Moore in a 1-0 setback to Tulsa.